While Faeries frolic at Amber Fox, I continue deep undercover as a super-dooper top secret secret agent to lure more faeries to Amber Fox. It has broadened beyond this Victoria Day Weekend gatherette (Still time to make it if you go soon). To do this I need some help from some very smart and fashion aware Faeries on some new outfits I have come across in a catalog. Please help choose from among these clever disguises. 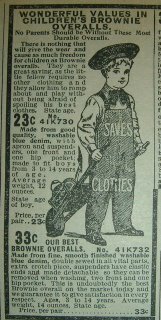 To the left is a pair of Brownie Overalls, they could double for working on The Land. 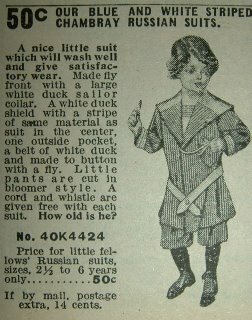 Then there is the classic Blue and White Chambray Russian suit to the right that comes with a whistle should I need to summon assistance in a hurry. 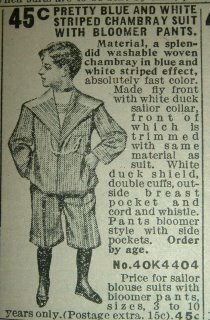 Next I found what is called a Pretty Blue and White Chambray Suit with Bloomer Pants. They would do fine for he office too once I gain employment in the far east. 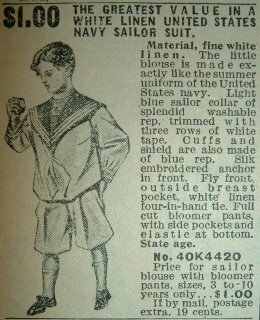 I am leaning to this one as in this day, what with all goings on in America a White Linen United States Navy Sailor Suit ought to make me welcome upon ventures into the the land of the free and home of the brave. Mark you votes or comments below. Don't worry about the prices as they appear to be very affordable. Remember not to tell anyone, I need to remain undercover cause that's what Super-dooper top secret secret agent's do!